A small, watery fixture of the Commonwealth, Lake Quannapowitt is located faaaaar in the north, almost exactly in the middle of the map. 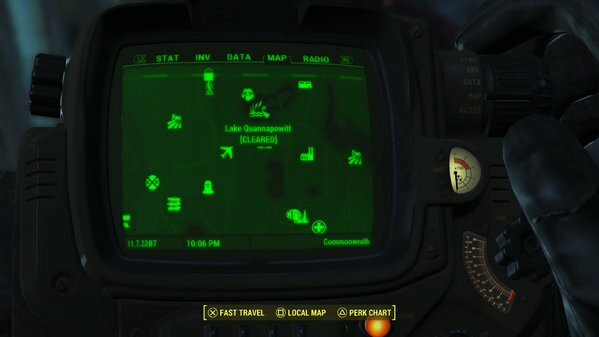 You can find it easily enough by leaving Sanctuary and travelling east along the periphery of the Commonwealth. It’s the second lake you’ll see. Watch out for Outpost Zimonja along the way, as it’s owned by Raiders. Perhaps the easiest, ‘safest’ way to find it is to head to the General Atomics Galleria, then look behind the northern buildings. The Lake is not amazingly huge, and not amazingly noteworthy. There are nevertheless a few things worth seeing if you visit. Be warned that Lake Quannapowitt is inhabited by a rather liberal number of Mirelurks of varying toughness - indeed, there are some tougher Razorclaw dudes up here - who can wreck you if you’re not careful. Aim for their heads with heavy-duty firearms when possible. There’s a small, lit shack in the north of the Lake, beside what looks like a water tower. There are various scrappable odds and ends in the shack. There’s also a terminal that hints at some severe pollution issues with the Lake. There are two drainage pipes flowing beneath bridges in the northeast of the Lake, where a large ‘island’ (term used loosely) is situated. The lower of these two pipes has Mirelurks Eggs at its entrance, and if you go inside you’ll be trapped by larger Mirelurks and an army of smaller Hatchlings. There’s nothing inside beyond enemy loot, so move at your own peril. A road runs along the north of the Lake. There’s a wrecked truck up here, and you’ll find a Fishing Tournament Ad sitting on its dashboard. How helpful. If you continue northeast from Lake Quannapowitt you can find a small side path leading to Recon Bunker Theta, the destination of a lengthy quest for the Brotherhood of Steel called The Lost Patrol. You can’t enter without completing the majority of said quest, however. Watch out for mines near the entrance if you decide to make a trip. If you head a little ways southeast of the Lake you can find Radio Tower 3SM-U81 overlooking the area atop a fair-sized, rocky hill. Activate it for greater radio coverage. Watch out for Bloodbug Hatchlings flitting about its base. Just north of the Radio Tower, separated by a road, is another rocky hill. There's a house atop it. You can find a Weapons Workbench at the base of the house, and inside is an Expert terminal. Hacking it will allow you to mess with spotlights, as well as activate a Protectron unit. Dude who lived here was well-guarded, obviously. … namely, that unless you have some heavy-duty radioactive protection, you should not go near the water. Lake Quannapowitt is ridiculously dangerous, thanks to an excess of radioactive barrels littering the seabed, and even in Power Armor you’ll be soaking up Rads like crazy. It is not worth the trip or the RadAway to hunt through the water, trust me. Hazmat Suit makes exploration feasible, but the lake is deep in spots and you may find it easy to lose track of your breath since they gave us no meter... some combination of: AquaBoy and Rad Resistant perk or Mirelurk Cakes and RadX recommended (ideally all of the above).